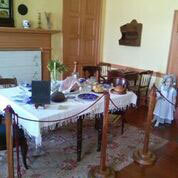 Based on a Federal Style, the Colonel Davenport House was built using technology known by a local carpenter. His method was to build the skeleton of the house as if it were a log structure. The logs were squared using axes and adzes and then notched to fit tightly against each other. Furring strips were then secured to the exterior, and pine clapboards were attached. Later, more conventional building techniques of frame construction were used. East and west wings were added to the house. A kitchen wing on the south was added. A small porch ran the length of the house. Davenport used the west wing as an office. The house was the center of a number of buildings, as many as thirteen. These additional buildings acted as warehouses and storehouses for the trading network. In 1907, restoration began and the east and west wings were razed due to disrepair. In 1998, the Colonel Davenport Historical Foundation raised funds and restored the roof, siding, windows, front porch and west wing. In 2011, the Colonel Davenport Historical Foundation broke ground on the east wing. 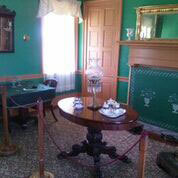 The Davenport House is historically important for several reasons. 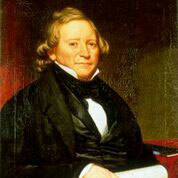 First, it reflects the growth in the prosperity of one man, George Davenport. 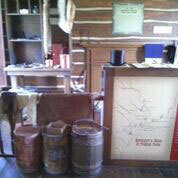 Davenport was a settler, provider, homesteader, businessman and counselor. His history equals the Quad City's history shaping its growth and development. On a much larger scale, it reflects the settling of the West. When George Davenport arrived with the U.S. Army in 1816, their mission was to establish fortification in the wilderness for the U.S. Government. The protection afforded by this fort attracted settlers to this wild, rich land. As a settler, Davenport was in a position to realize the possibilities of further trade with the Indians. He also prospered as an Agent of the American Fur Company. He quickly branched into other businesses, sending the first keelboat-load of lead down the river to St. Louis. During the Black Hawk Wars, Davenport was a fur trader and respected citizen. This put him in a natural position to act as a mediator between the Indians and the U.S. Government. The coming of the steamboat in 1823 into the upper Mississippi Valley region brought more settlers and possibilities for further business dealings. With his increased prosperity, Davenport wanted a home, which he built between 1833-1834. The house became the center of local commerce, a crossroads for trade in the region. Later, this home laid the foundation for the Quad Cities of Iowa and Illinois. 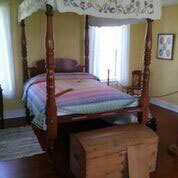 Come hear about the fur trading and its importance in the life of George Davenport. Learn about the types of furs traded in the Quad City area. Listen to how George Davenport bartered with the local Indians in building the local economy.